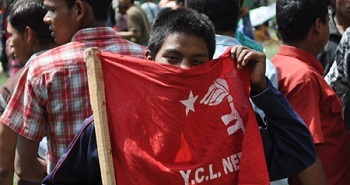 According to the following article in Telegraph Nepal,the wing of the Unified Communist Party of Nepal (Maoist) led by Kiran has replaced the YCL with a new fighting force called the Janasevak Bureau. The force is reportedly led by UCPN(M) politburo member, Biplab, a radical young leader. 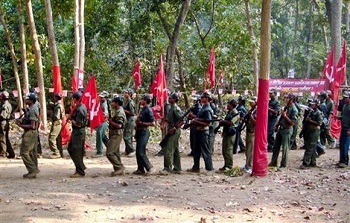 The panel led by nationalist leader, Mohan Baidya ‘Kiran’ of Unified Maoists’ Party, has declared formation of a separate ‘fighting force’ comprising of dissatisfied, UNMIN disqualified Militias and some YCL cadres. The unit thus formed will be called as ‘Janasevak Bureau’ was declared amid a program in Lalitpur, April 24, 2012. This report appeared at Zeenews. Kathmandu: Pro-Maoist students close to the hardliner faction led by Mohan Vaidya ‘Kiran’ have staged a demonstration here against alleged Indian interference in the formation of a national government in Nepal. The protesters briefly clashed with the police while organising a torch lit rally at Ratnapark and Kamaladi area in the heart of the capital last evening, eye-witnesses said. They also obstructed traffic for an hour to show their protest against what they called “direct intervention of India” in Nepalese politics. “We protest India’s direct interference in our internal issues,” said Ratna Dhakal, central committee member of the All Nepal National Independence Students Union- Revolutionary. 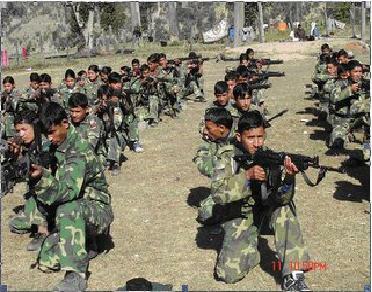 Nepal – Development of a new People’s Liberation Army? The political struggle in Nepal appears to be sharpening. We urge the usual caution in reports from the bourgeois press. Apart from this, in every village they entered, the government forces resorted to loot, beatings, razing of houses and destruction. In Padko village on the southern side of Indravati River, the government forces destroyed a field. People are collectively growing vegetables, maize etc in this field. In the forest nearby this village a school is being run by the revolutionary Janatana Sarkar and hundreds of government forces attacked this school. The entire students and teachers had evacuated the school beforehand fearing attack. The police camped for two days there and wreaked havoc. Thanks to Banned Thought for making this document available. Condemn the brutal offensive conducted by the government armed forces in Maad ! The following statement calls for an end to the recent resurgence of US military involvement in the Philippines. Thanks to Democracy and Class Struggle for making this available. 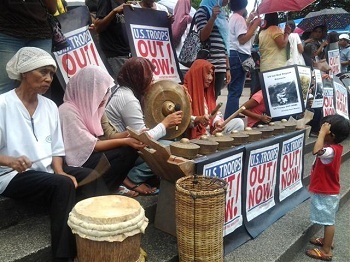 The Communist Party of the Philippines (CPP) urged the Filipino people to push for the repeal of the US-RP Mutual Defense Treaty of 1951 and the pullout of all American military troops in the Philippines in order to ease military and diplomatic tensions over the Scarborough Shoal and Spratly Islands and pave the way for the peaceful resolution of the conflict and build mutually beneficial relations with both China and the US. 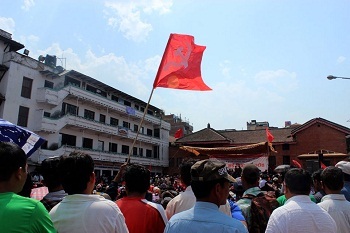 The following report on various May Day events and speeches in Nepal comes from The Red Star. Thanks to Banned Thought for this important new interview by Basanta, a Politburo member of the UCPN (M). This interview strongly condemns Prachanda and Bhattarai and explores what has gone wrong in the Nepal Party. 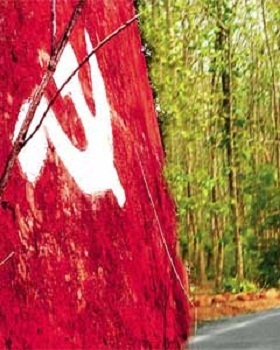 The CPI(Maoist) has very deep roots among the people, gaining support in areas that the Indian state was, apparently, not even aware of. The piece originally appeared at the Hindustan Times. Thanks also to The Prison Gates Are Open site for making it available. Helicopters were kept on standby for casualty evacuation; targets were chosen with care after studying satellite images and the troops were warned — the encounters would be fierce and the naxals could be in the hundreds, even thousands. After weeks of planning, security forces armed with automatic rifles, satellite phones and Swedish Carl Gustav rocket launchers made their very first foray into the dense Abujhmad jungle, straddling the two states of Maharashtra and Chhattisgarh. Abujhmad, or ‘unknown hill’ — 6,000 sq km of thick forest — has not been surveyed since the British. Peter Tobin writes from Nepal about the recent takeover of the PLA cantonments by the reactionary army. His comments originally appeared at Democracy and Class Struggle. I am among the many international supporters of the Nepalese revolution. 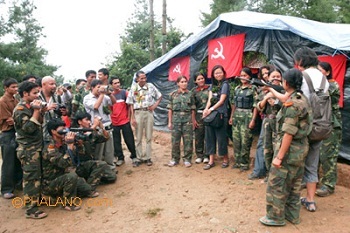 Ever since the UCPN(M) took the heroic decision in 1996 to launch the People’s War we have watched in astonishment as this party made an important and unique contribution to proletarian history when it appeared that globally communism was on the retreat. The Soviet Union, in Comrade Castro’s words had: “committed suicide’ and China had decisively become state capitalist and so there was no socialist support base to turn to. Millions of people in India build their homes and shelters on land technically ‘owned’ by the state. 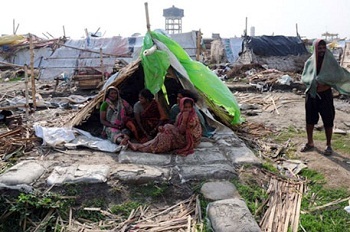 In West Bengal, the Trinamool Congress government has been selling off this land to corporations, which means the squatters and slum residents are brutally evicted. All in the name of ‘development’. Recently officials have set their sites on the Nonadanga slum in Kolkata, attempting to displace residents and jailing all who resist. The following article in Radical Notes provides a useful political and economic analysis of the situation. Nonadanga is at just a stone’s throw from the eastern metropolitan bypass behind such glitzy corporate hospitals like Fortis, Ruby and Desunand and plans are on to transfer the land at throwaway prices to big real-estate projects by ‘Urbana’ and IT hubs. Obviously, in such a strategic location in a metropolis, they will not tolerate slums and ‘all these dirty people’. Condemn Repression in the name of ‘Development’ of the ‘Beautiful’ ! Demand Immediate Release of Arrested Dissenters !! We have received the following call for solidarity with activists and residents of Nonandanga who were recently arrested while defending the community. We encourage our readers to sign the petition and to seek out other ways of expressing solidarity. 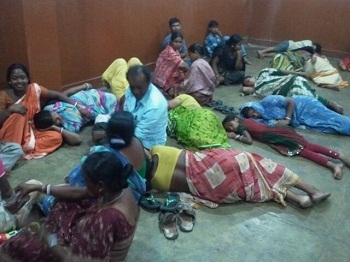 demanding rehabilitation of hundreds of residents evicted from the Nonadanga slum of Kolkata on March 30, 2012. The peaceful character of their protest is a matter of public record, documented by various media reports. We are shocked and dismayed at the response of the police forces to these democratic protests. Kindly read and sign the enclosed petition on the Nonadanga situation. Click here in order to sign the petition. You may also read regular coverage of this developing story on our website Sanhati. The Royal Nepal Army, along with the Armed Police Force (a group trained and backed by US imperialism), have assumed command of the cantonments occupied by the remnants of the Maoist People’s Liberation Army. The revolutionary faction is strongly condemning this move as well, placing the blame on the shoulders of Maoist leaders Prachanda and prime minister Bhattarai, and accusing them of a “serious betrayal of the revolution”. The revolutionary faction also seems to have implemented an extensive protest program, mobilizing the people against Bhattarai’s government. The following article appeared at My Republica. 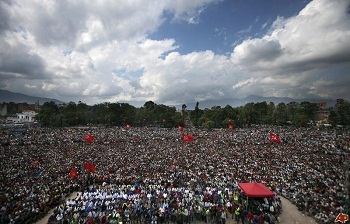 KATHMANDU, April 10: Accusing Chairman Pushpa Kamal Dahal and Prime Minister Baburam Bhattarai of betraying the revolution, the Maoist radical faction on Wednesday evening called on the people to raise voices against the Special Committee decision to let the Nepal Army (NA) take charge of the PLA cantonments and the weapons containers. “We strongly condemn the decision. We also appeal to the patriots, republicans, self-esteemed people as well as those who want forward looking changes to jump into action and oppose the move,” said Maoist Secretary CP Gajurel after a meeting of the radical faction in the evening. This article is from myrepublica. Maoist General Secretary Ram Bahadur Thapa , a key leader from the party’s radical faction, issued the directive from a closed-door session held at Nayabazaar, Kathmandu, to train cadres from the faction. “We may have to jump into action around May 28 (the constitution drafting deadline). The immediate circumstances will dictate whether such an insurrection will be armed or unarmed,” a participant quoted Thapa as telling the cadres. The Himalayan Times reports that the left section of the UCPN(M) has formed a united front with twelve other, smaller, communist parties to oppose the Bhattarai-led government. These plans include mass mobilizations and other protest initiatives. UCPN(M) Chairman Prachanda is still supporting Bhattarai, though his tone had been more critical as of late. We will post more on this situation as it develops. KATHMANDU: The united front of various fringe communist outfits and the dissident faction of UCPN-Maoist, led by Mohan Baidhya, on Friday unveiled a three-month struggle programme to exert pressure on the incumbent Dr Baburam Bhattarai-led government for the timely constitution. 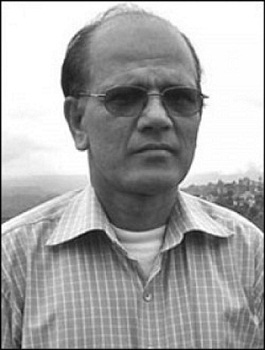 Maoist Secretary CP Gajurel, a pillar of the Baidhya faction, has been chosen as the coordinator of the 12-party alliance.